Our embryologist uses a fine, high-powered laser to drill a small hole in the zona (shell) of the embryo. This does not hurt the embryo, and may assist embryos to hatch from their shells. 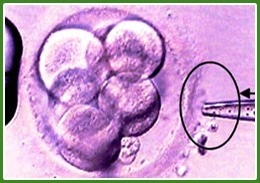 Laser hatching can improve implantation rates in cases where embryos are created with eggs from mature mothers – in which case the embryo shell is thought to be tougher – and with embryos that have been frozen and thawed.